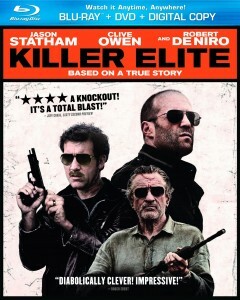 Killer Elite, the action film based on a true story, is coming to BluRay and DVD on January 10, 2012. Based on a shocking true story, Killer Elite is a gritty battle between guns-for-hire that has been hailed as “one of the best action thrillers of the year!” by Richard Roeper, ReelzChannel. Pitting two of the world’s most elite operatives against the cunning leader of a secret military society, Killer Elite stars Jason Statham (The Transporter, Death Race), Academy Award winner Robert De Niro (The Godfather Part II,Raging Bull) and Academy Award nominee Clive Owen (Children of Men, Closer). Directed by Academy Award nominee Gary McKendry (Everything In This Country Must), Killer Elite is available on Blu-ray Combo Pack with UltraViolet, DVD, On Demand and Digital Download January 10, 2012 from Universal Studios Home Entertainment and Open Road Films. You can pre-order Killer Elite right here. Comments for “Killer Elite” Comes To BluRay and DVD are now closed.